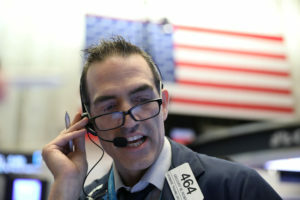 NEW YORK — Stocks dropped again Tuesday as losses mounted for the world’s largest technology companies. Retailers also fell, and energy companies plunged with oil prices as the market sank back into the red for the year. Investors are measuring a number of headwinds and increasingly playing it safe. The Dow Jones Industrial Average has lost 3.7 percent in the last two days, and the S&P 500 is off 3.4 percent. The Nasdaq, heavily populated with technology stocks, is off 4.7 percent. The S&P 500 index has fallen 9.9 percent from the record high it set exactly two months ago. For much of this year, investors were hopeful the U.S. and China would easily resolve their differences on trade. That hope has faded in the last two months. Later this month U.S. President Donald Trump and China President Xi Jinping are expected to meet at a gathering of the Group of 20 major economies, and for investors, the newly proposed limits on tech exports were one more hint the leaders probably won’t reach a deal. Apple fell 4.8 percent to $176.98 and is down 23.7 percent from the peak it reached October 3, though it’s still up almost 5 percent this year. Microsoft lost 2.8 percent to $101.71 and IBM fell 2.6 percent to $117.20. The price of oil has been falling sharply in recent weeks and is now down 30 percent since October 3. Saudi Arabia and other countries started producing more oil earlier this year after the Trump administration announced renewed sanctions on Iran, Nixon noted. The administration then granted waivers to several countries allowing them to continue importing Iranian oil, creating a supply glut that pushed prices dramatically lower. Earnings from retailers didn’t help investors’ mood. Target plunged skidded 10.5 percent to $69.03 after reporting earnings that missed Wall Street’s estimates due to higher expenses. Ross Stores, TJX and Kohl’s also fell on disappointing forecasts. Benchmark U.S. crude closed at $53.43 a barrel in New York, its lowest price in a little more than a year. Brent crude, used to price international oils, fell 6.4 percent to $62.53 per barrel in London. Student loan servicing company Navient dropped 10.6 percent to $10.73 after The Associated Press reported on an audit by the Department of Education that showed Navient may have driven tens of thousands of borrowers struggling with their debts into higher-cost repayment plans.